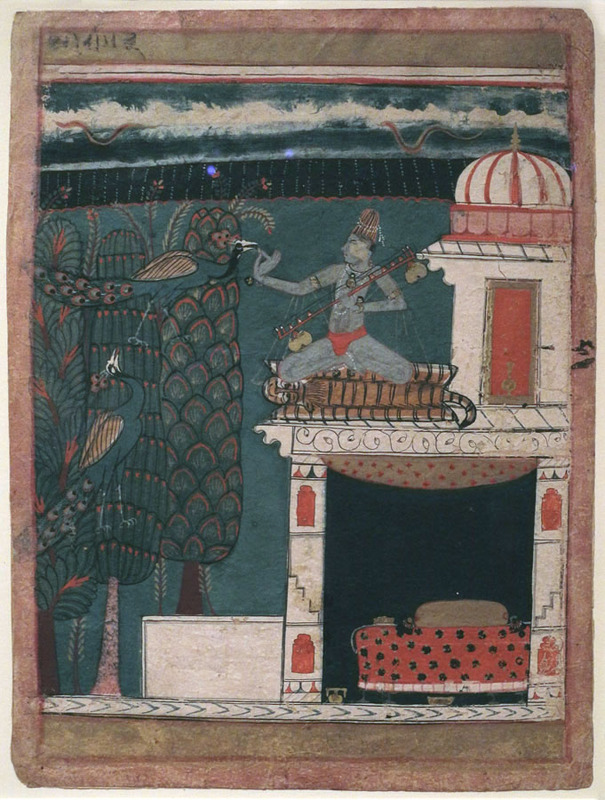 Studio and Garden: At the Met: "Ragamala: Picturing Sound"
9 13/16 x 7 7/8 in. It is always a delight to see an exhibit of Indian paintings; their forms and colors are so engaging, and their intimate size invites close looking. Their worlds are magical, with attention paid to flowing, brightly colored garments and elegant limbs, and to the riches of nature. And some paintings are celebrations of music and of love. 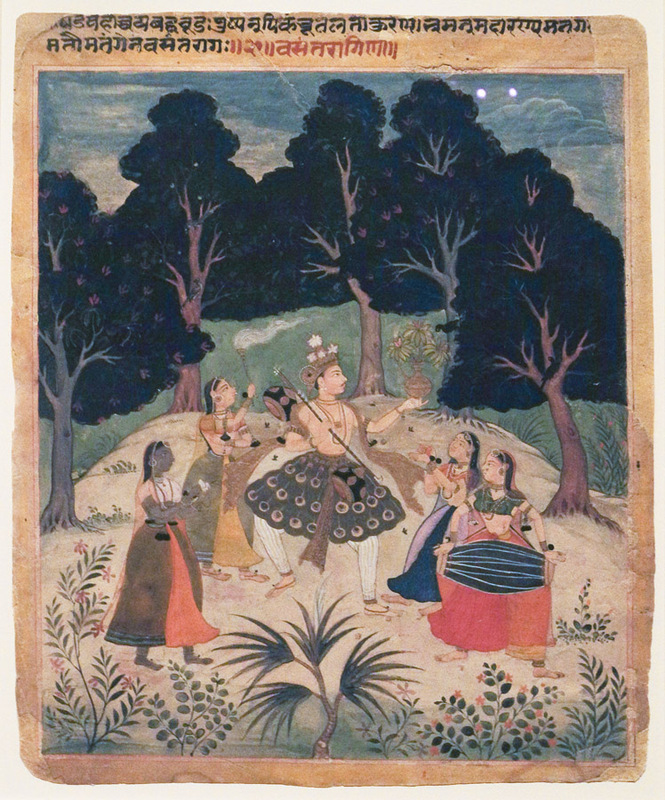 There's a small show of paintings, titled "Ragamala: Picturing Sound", in one of the Met's almost-secret galleries, up some stairs at the end of the Indian galleries. Any information I have comes from the Met's description of the show and of the individual paintings, all 20 of which you can see at the link. 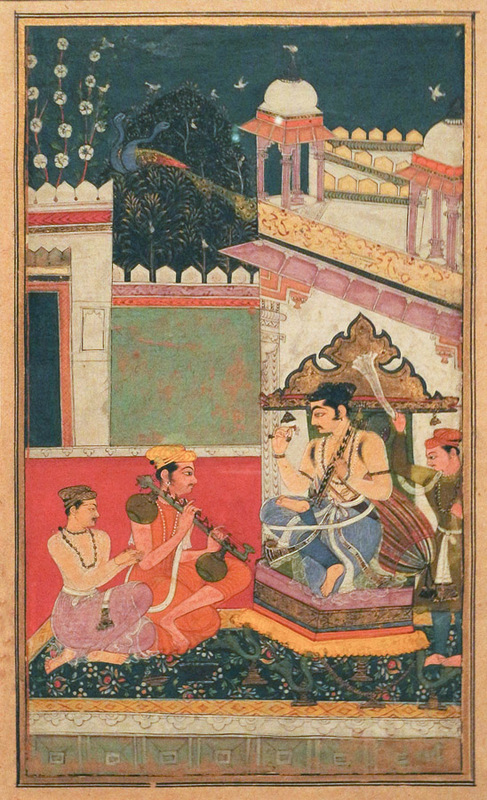 A ragamala is a group of paintings, gathered in a folio, which depict a range of melodies, with different moods. In some paintings, as the one above, the mood is written as poetry in the margin. 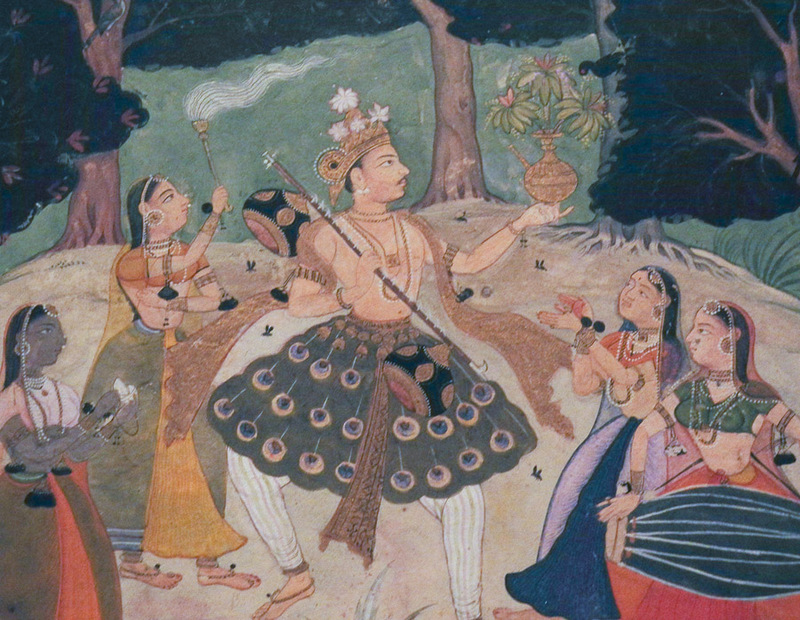 And to quote the exhibition description, "The unifying subject of a ragamala is love...."
This painting is a celebration of spring. I love the flowers in the nobleman's hat, the pot of flowers he holds high; he dances, like Krishna, surrounded by beautiful maidens. 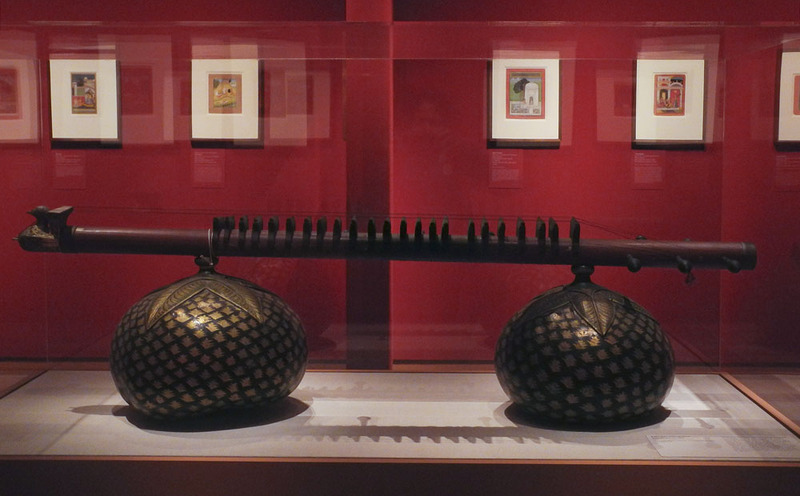 He carries a musical instrument, made with two gourds, beautifully decorated, like the one below. Mahati Vina, India, ca. 1885; gourd, various materials; 56 x 14 in. This type of stringed instrument is pictured in many of the paintings; it was wonderful to see it, and see the care with with it was decorated. 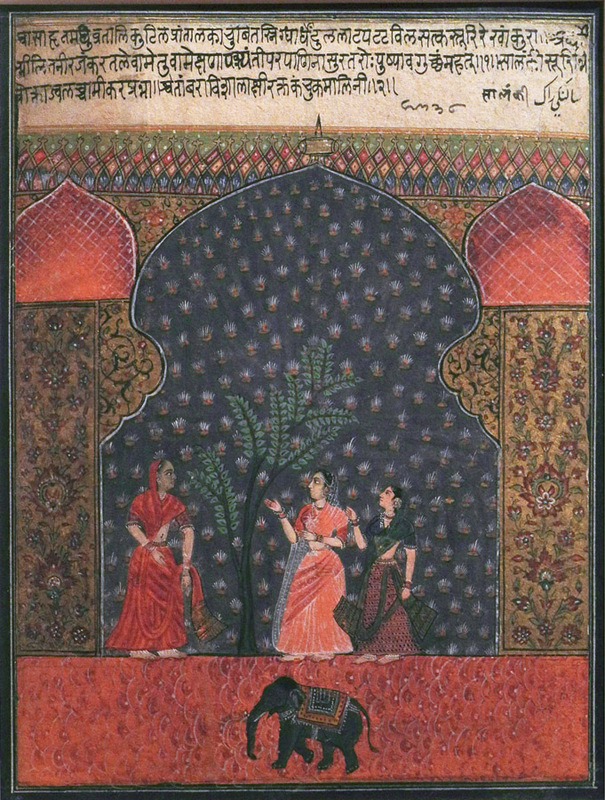 Ruknuddin, Kedar Ragini, India (Bikaner, Rajasthan), ca. 1690-95; opaque watercolor and ink on paper; image: 5 7/8 x 4 11/16 in. This image is so subtle and delicate, the evening light soft and color subdued. 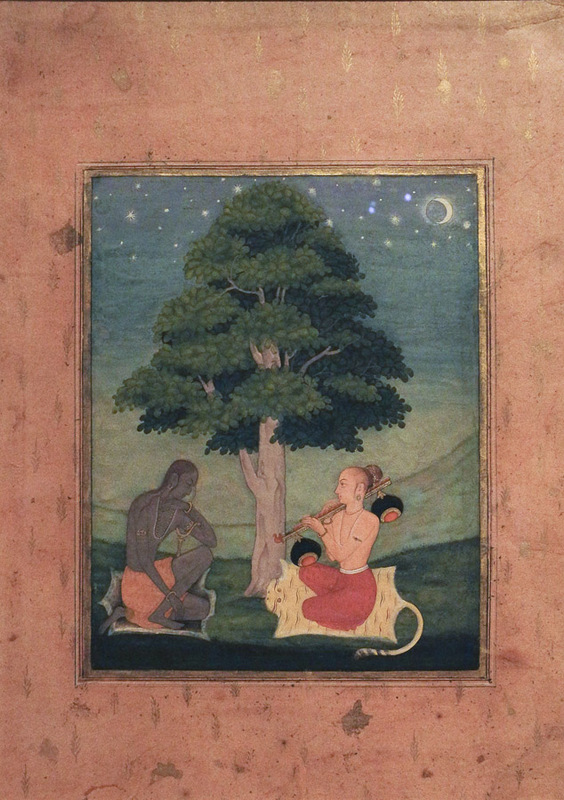 The artist has illustrated texts that describe "an ascetic 'in penance, adorned, gray [with ashes]' listening to a disciple, who is described as 'a young man beauteous in every limb', playing the rudra vina." 7 5/8 x 5 3/4 in. 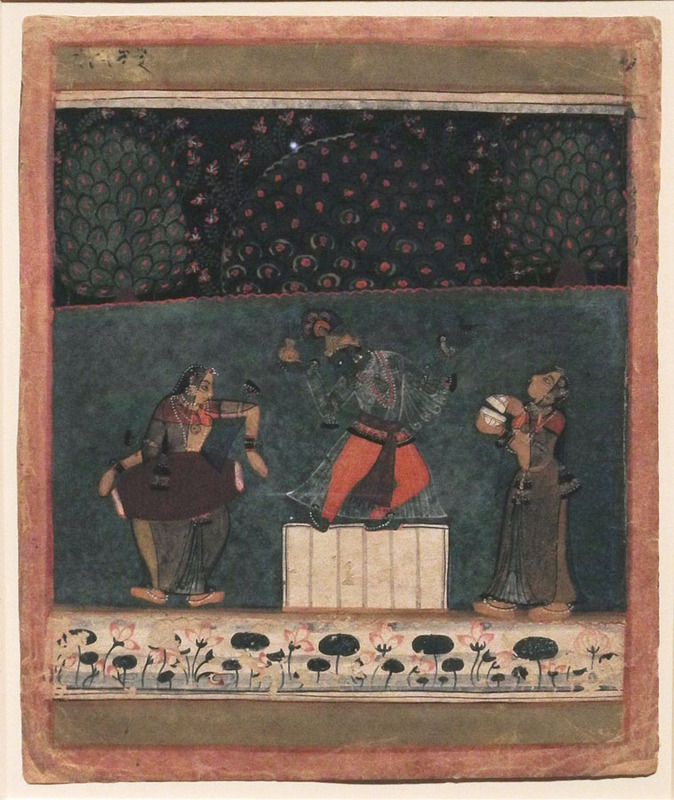 Krishna dances in another homage to spring. The line of flowering plants at bottom, and trees at the top of the painting, are fanciful and celebratory. 13 1/4 x 9 3/4 in. The rainy season is evoked here with the bands of clouds at the top of the painting, with stylized lightning looking like brown snakes. What is most wonderful are the imaginatively patterned trees and the vivid birds, and Krishna's delicate gesture in feeding one of them. 8 1/4 x 4 3/4 in. 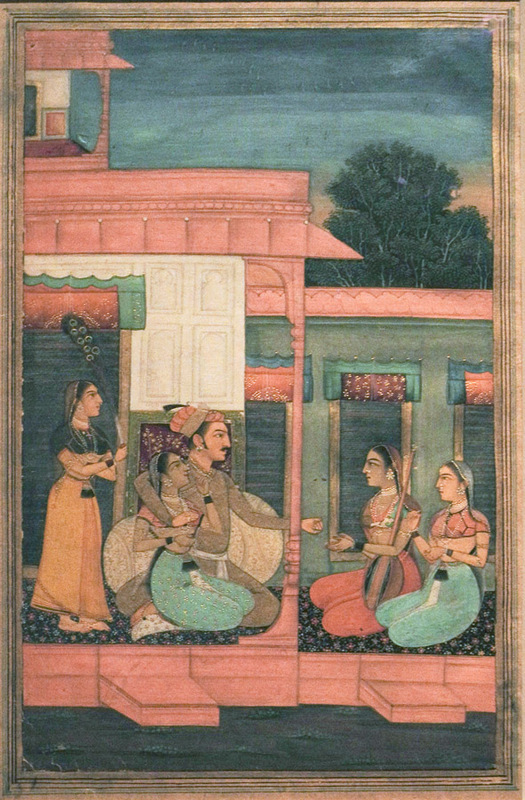 What I love most about Indian painting is the use of color: the juxtapositions of different hues and values is brilliant; orange against red; violet with orange, blue and pink and tan and yellow; a rectangle of green topped by bands of violet and orange; yellow parapets, white ones. 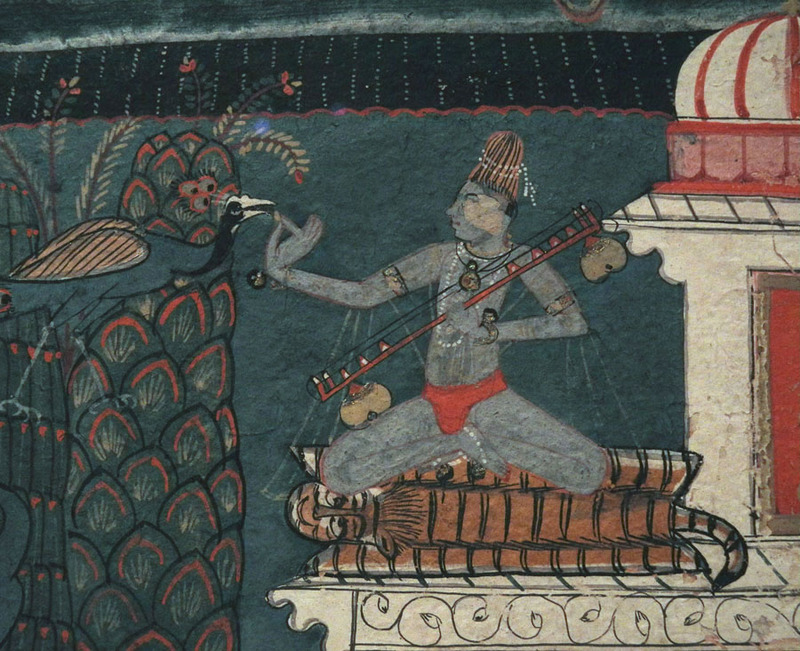 There are so many ideas about color that I often refer to my books on Indian painting when I'm working. 10 5/ 16 x 8 3/4 in. This painting has a very different color mood, deep and rich. 7 3/4 x 4 7/8 in. More gorgeous color adorns this painting; a strong salmon pink creates a structure that is punctuated by the greens of clothing and wall. This painting "expresses entertainment, happiness, and love". Andhrayaki Ragini, India (Himachal Pradesh, Bilaspur), ca. 1710; ink, opaque watercolor, and gold on paper; 8 1/2 x 6 1/8 in. What a marvel of pattern adorns this painting, pattern to describe a terrible storm, lightning outlined in gold. 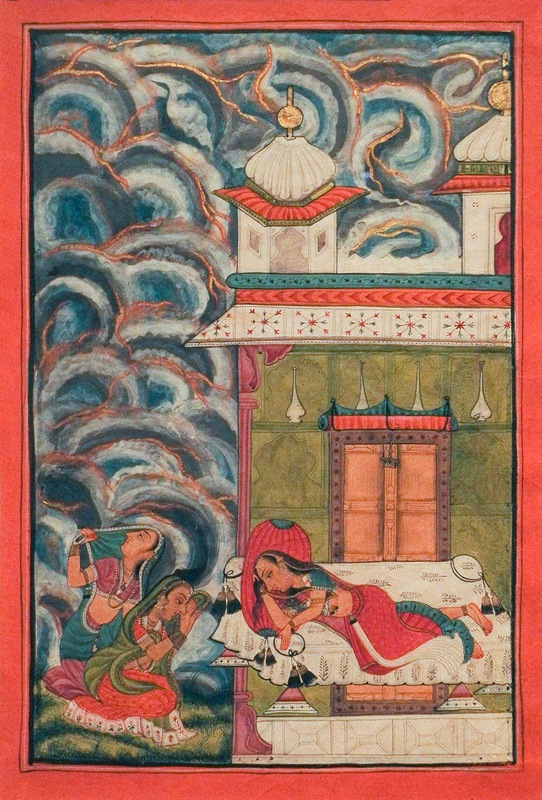 The storm is meant as "a metaphor for the turmoil of love". 8 1/4 x 6 1/8 in. 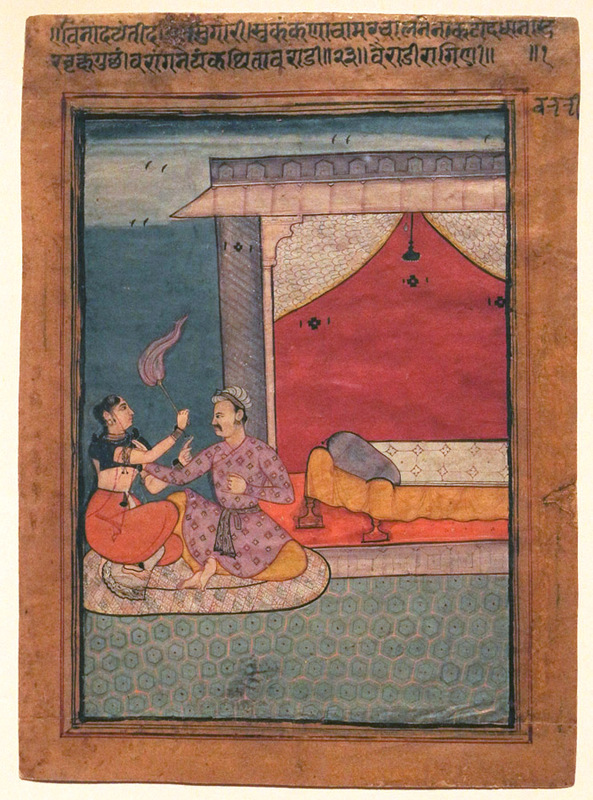 A strong, beautiful red shape above an orange floor and yellow bedspread, surrounded by a violet structure: the painting would be wonderful with just those shapes and colors, but there is also a story, which is told in the ragamala text: "That most beautiful one, wearing fine armlets....[is] holding off her beloved with her fly-whisk." A quarrel, her finger pointed upward...no!...his hand attempting to touch her. With elegance and beauty and restraint, the tale is told. Thank you, Altoon - these are delightful little gems. Next time I'm at the Met, I'll head straight for this secret room. I'm pleased you like these paintings, Lauren. There are seemingly endless rooms at the Met to explore.